Definition at line 91 of file openvpn.h. Definition at line 94 of file openvpn.h. Referenced by check_ping_send_dowork(), check_send_occ_msg_dowork(), free_context_buffers(), init_context_buffers(), and ipv6_send_icmp_unreachable(). Definition at line 98 of file openvpn.h. 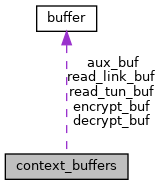 Referenced by free_context_buffers(), init_context_buffers(), and process_incoming_link_part1(). Definition at line 97 of file openvpn.h. Referenced by encrypt_sign(), free_context_buffers(), and init_context_buffers(). Definition at line 110 of file openvpn.h. Referenced by free_context_buffers(), init_context_buffers(), process_incoming_link_part2(), and read_incoming_link(). Definition at line 111 of file openvpn.h. Referenced by encrypt_sign(), free_context_buffers(), init_context_buffers(), and read_incoming_tun().